The Office Suites Monitor Riser places your monitor at a comfortable viewing height to help prevent neck strain! Designed to support up to 80 lbs. and elevate monitor to maximize workspace. Height adjusts up to 2.5inch (between 4inch and 6.5inch) for optimal viewing angle. Stow your laptop underneath for in-office use and extra desktop space. Storage tray organizes business essentials for easy access. 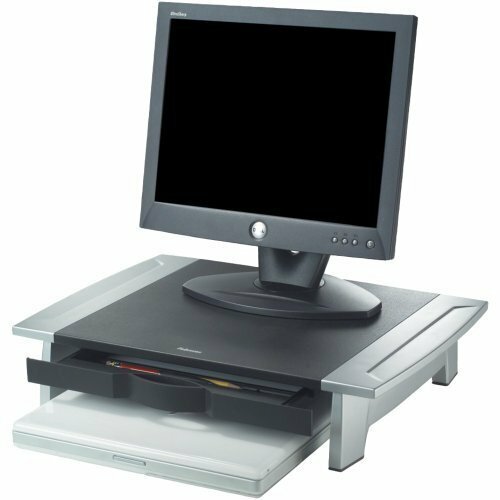 Non-skid rubber feet protects work surface from scratches or scuffs.This strikingly handsome Fellowes monitor riser elevates your monitor to the most comfortable viewing levels, bringing you stress-free comfort and a sure-fire way to prevent neck strain. Features handy, easy-access drawer for additional storage and has plenty of room to store your laptop beneath the riser. Small, space-saving design gives you more room on your desktop! Youll be more comfortable and more productive with the Fellowes monitor riser - yours for a terrifically low price! Fellowes - for the workspace you have always wanted.